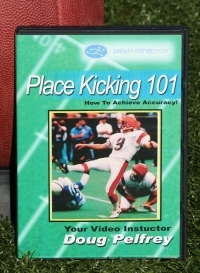 Accuracy… what every kicker wants and what Doug Pelfrey shows you how to achieve. In this program, Doug shares with you insider tips on: Stretching, Target Zone, Alignment, Your Stance, Holding, The Sweet Spot, The Plant Foot, Ball/Foot Contact, Follow Through, and The Approach. Doug has set records thoughout his career. He’s the 2nd all-time leading scorer at the University of Kentucky and the NFL’s Cincinnati Bengals. During his pro career, he has set records for most field goals in a game and in a season, the most points in a season and was the team’s leading scorer each year he played. At one point, Doug was the most accurate kicker in NFL history as well as man of the year 5 times.